Easy on/off I-55 and well-signed all the way to campground office. 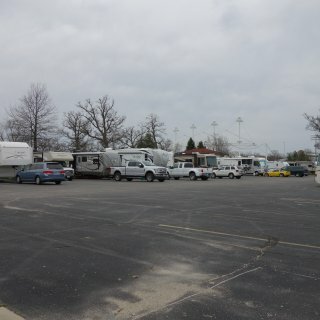 Over 300 sites but everyone is lined up in the one level back row of the paved parking lot of Campground Section B. These are the full hook-up sites. All utilities are at the back of the site by the metal guardrail. You will need at least 2 sewer hoses to reach the sewer connection. The dump station is somewhat inconveniently located past the campground office with a sharp loop turn and a dead low-hanging branch. The bathrooms are older but clean and well lit. An abundance of trash receptacles. Overall, not a bad place to stay for the price if you want to take in the sites of Springfield. 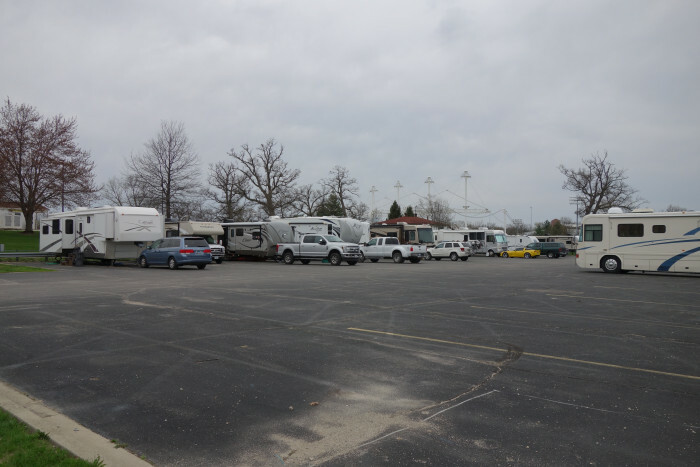 We camped at Illinois State Fair Campgrounds in a Fifth Wheel. Good experience. Just an overnight stay. Our gravel pull-through was fairly level, long and easy to get into. Quiet park that closed their entrance gate at 8:30 pm so I felt very safe walking my dog. Friendly and efficient check-in process. The pool was not open yet. Playground for kids. Would definitely stay again if in the area. 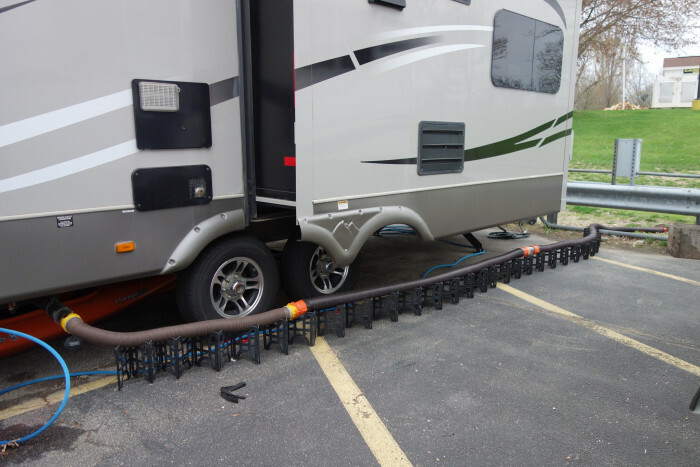 We camped at Gunsmoke RV Park in a Fifth Wheel. Basically a gravel parking lot of mostly pull-through, full-hook up level gravel sites. Full sun but also nothing to hit. Easy on/off I-10 and the price is certainly right (we are Escapee members). Efficient office staff. Nice laundry room. We camped at Dream Catcher RV Park - Escapees Rainbow Park in a Fifth Wheel. Restaurants, Walmart, etc. in town. We ate at Benji's and it was excellent. There are interesting State Parks nearby that are well-worth a visit. Every non-permanent site is a 75 foot-long pull through, 30 feet wide, full hook up site. The entire park is gravel. No shade. No picnic tables or fire rings. Very easy on/off Hwy 54. We drove in and selected our sight. The office is open from 5 - 9 pm. Nice overnight stop. We camped at Western Star RV Ranch in a Fifth Wheel. Located five miles east of Liberal, Kansas. Lots of shopping and restaurants in the actual town of Liberal. This was our second time staying in this park both times in the same long, level gravel pull-through full hook-up site. This park is mostly permanent resident sites but is easy to get to and fine for an overnight stop. Sadly, in our opinion, this park is adjacent to a gun club so expect lots of gunfire. We camped at Hickory Hill Campground in a Fifth Wheel. There are restaurants in nearby El Paso, IL. This is a small campground with eight water and electric only (no sewer hook ups) pull-thru RV sites and some primitive tent sites. There are no showers or restrooms (there are two pit toilets). There is a dump station near the entrance but when exiting the park, it is located on the opposite side with no room to turn around. Our site was mostly level and nice and long. 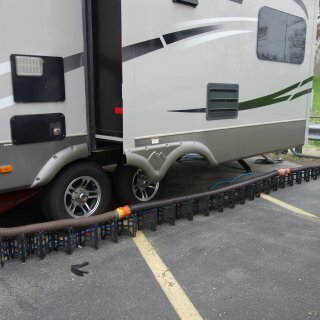 The first turn into the park is sharp but we are a 40' fifth wheel; shorter RV's would not have any problem. This is a great base camp for exploring the Apostle Islands area. We will definitely return if we are in the area. We camped at South Shore Campground in a Fifth Wheel. Meyers Beach, part of the Apostle Islands National Lakeshore is approximately a mile down the road - great for kayaking and hiking. Cornucopia is a quaint little village with a good restaurant and a historic general store. 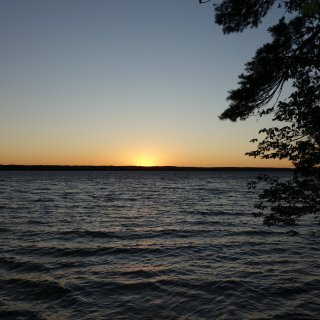 This is a beautiful Michigan State Park. The sites are grassy and roomy. Our site was a level 50 amp pull-through. We were told we could pull in from either direction so we chose to pull in so Indian Lake was visible out our back window. One lovely two-mile hiking trail. Convenient dump station near the exit. The only negative was the site next to us, site 65. Because of the location of a water fountain, the electric box, firepits and wood posts on the opposite side of the road, site 65 is a difficult site to maneuver. We watched three different campers on three consecutive nights struggle to back into site 65. 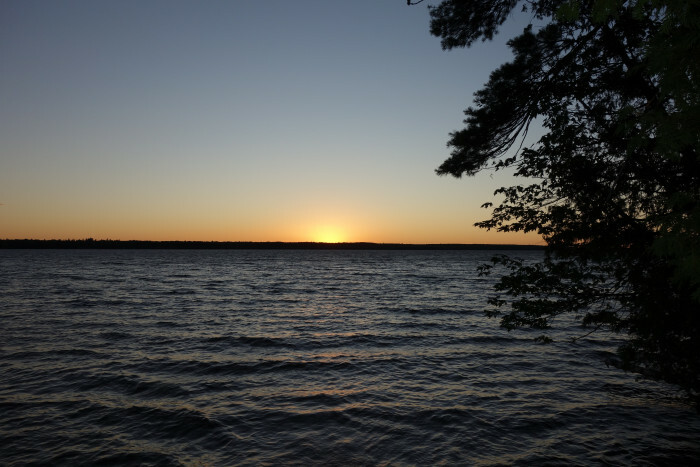 We camped at Indian Lake State Park in a Fifth Wheel. Jack's Market and Three Seasons Restaurant in Manistique are both highly recommended. Easy on/off access to I-80. We had a long level 50 amp gravel pull-thu with plenty of room for our 40' 5th wheel and truck with room to spare. Interior roads are gravel and there are mature trees but plenty of room to maneuver. Our rate of $21.00 reflects a Passport America discount which is a great deal for this park but only offered during the off-season. We camped at Area's Finest Country View Campground in a Fifth Wheel. Easy highway access if you need a place to stay in Denver area. We had a 50 amp electric and water asphalt back-in site. Sites 8 - 12 are angled the wrong way for a driver's side back in and not that long. Sites 1 - 7 are straight back-ins and much longer sites. Sites would be cramped if all were full. Turn around dump station at end of road. Nice walking/bike path. The restrooms were the highlight - very clean and brightly lit and the showers were coded private stalls, very clean, warm, well-lit and hot water. We camped at Jefferson County Fairgrounds in a Fifth Wheel. Very convenient to restaurants and shopping. Sand Hollow is Utah's newest state park opened to the public in 2003. This review is for the Westside Campground. This park is nicely designed to accommodate bigger rigs. We had full hook ups and a fairly level paved back-in site. Nice picnic table shelter otherwise no shade. No recycling. Beautiful views of lake and mountains. Great for boaters and OHV's. No hiking trails. We camped at Sand Hollow State Park in a Fifth Wheel. Hurricane is more touristy with antiques and gift boutiques. Nearby Washington City has everything one could want with chain stores and restaurants. Our GPS couldn't find the exact address and the entrance sign is unobtrusive so we miss the entrance and had to drive around the block.Once in the park, the registration area is large and able to accommodate several rigs. We were welcomed by a friendly host and the check-in process was efficient. We were escorted to our level sand 50 amp pull-through site near the back of this huge 55+ park. Basically no shade anywhere. Paved roads throughout. Two pools, pickle ball courts and a grassy dog park. Extensive list of dog rules. Overall a nice clean quiet park. Our rate reflects a Passport America discount. We camped at Fiesta Grande RV Resort (55+ park) in a Fifth Wheel. Casa Grande has everything you need as far as shopping. Formerly Root 66 RV Park, this campground has new, young owners who are gradually making improvements to what was once a Route 66 Motel/ old RV Park. Both 30 amp and 50 amp and back-in and pull-through sites are available. Very easy on/off I-40. There is highway noise as I-40 is visible from one's campsite. Small dirt dog park with bags & scoopers. During our stay, the showers were being renovated/constructed. Wi-Fi spotty and no local tv. No shade. We camped at Sun Valley RV Resort (formerly Root 66 RV Park) in a Fifth Wheel. Close to Petrified Forest National Park which is spectacular! No stores or restaurants in Sun Valley. Nearby Holbrook has a Safeway and a Dairy Queen and several restaurants. Roma's Mexican Restaurant is excellent. Three S's: No Sewer, no Shade, and no showers. That being said, let's get on to the good things: Wide paved roads with generous and level gravel water and 50 amp electric sites. 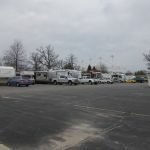 Of the 96 RV sites, 8 are pull throughs (also gravel). You need a long hose to hook up to water. Two conveniently located dump stations at the entrance/exit. We drove in, selected our site and a park attendant drove up in an ATV to collect the fee (cash or check). We camped at Big Rock Campground in a Fifth Wheel. Big Rock Campground is part of Big Rock Forest Preserve and there is 10 miles of nicely maintained mowed/gravel trails throughout the preserve accessible from the campground.